Champagnat School, Habana, Medal, Honor. 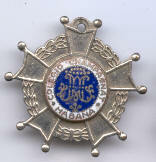 Champagnat School, Habana, Medal, Legion de Honor. Champagnat School, Habana, Medal, Notable. Champagnat School, Habana, Medal, No Subject.